Editor’s Note: the following Pete Dunton article was originally published on December 8, 2013 on Mustang Pasture. 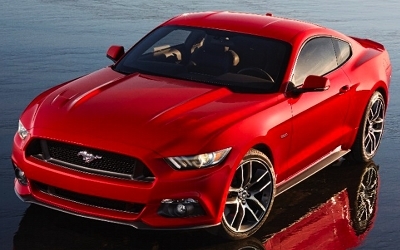 This past week Ford has just unveiled its all-new 2015 Mustang. There has never been more speculation and more Internet chatter about a future car model than the new 2015 Ford Mustang. Ford has promised a departure from the popular retro look of the current 5th generation Mustang. And this alone has had everyone wondering if Ford could pull off such an endeavor while keeping Mustang’s core buyers happy. With interest in the new Mustang at 9,000 rpm on the curiosity tachometer, Ford decided to take the plunge to reveal the new Mustang to the world early. Ford originally wanted to unveil the new Mustang much closer to the 50th anniversary this Spring of the release of the original 1964 1/2 Mustang. However with just about every test drive of the new Mustang in heavily camouflaged wrappings by Ford employees was captured by the camera’s of onlookers and posted on the Internet. This coupled with the fact that just about every artist or gear head with photoshop experience was making his own rendition of what the new Mustang was to look like. To say the speculation was getting out of control, is a gross understatement. Never-the-less there will be no more speculation since Ford has officially released photos of the 2015. And the photos will probably put a lot of Ford Mustang fans and purists at ease. When it was announced the Mustang would move away from retro styling this had many Mustang fans upset. After-all we’re not dealing with a regular group of car owners here. Mustang fans are the most loyal automobile owners you are going to find. This is the same group that saved the tradition rear-wheel drive Mustang from extinction when word leaked out Ford planned on moving the Mustang to a all-new front-wheel drive platform by the late-1980s. Fans took the time to send letters to Ford and voice their strong opinions against such a crazy decision, and it worked. Ford then changed its mind and decided to release what would have been the first front-wheel drive Mustang as the 1989 Ford Probe and then replaced the aging Fox body Mustang with an all-new rear wheel drive Mustang for the 1994 model year. Turns out the fans knew what was best. The Ford Probe only lasted for a few years and received paltry sales. The 1994-2004 Mustang however was a mega sales success. It was in fact so popular while GM’s F-body Camaro and Firebird sales were so stale that GM canceled production of these two F-bodies at the end of the 2002 model year. Continued hot Mustang sales eventually forced Chevy to release an all-new Camaro for the 2010 model year. Even Dodge which had been out of the rear-wheel drive pony car game since 1974 Dodge Challenger production ended, felt compelled to release an all-new rear-wheel drive Challenger for 2008. In other words the sales landscape has changed since the last unveiling of a new Mustang for the 2005 model year, the competition is fierce with the Camaro, Challenger, and Mustang all vying for sales in the same narrow market. The Mustang has done extremely well even under these more competitive conditions. However the strong competition puts heavy pressure on Ford to keep the Mustang more appealing than its competition. That’s why the designers and engineers on the 2015 Mustang team had a lot of stress. A bad body design could sink the Mustang and send its sales plummeting. And the Mustang is much more than a car, it’s an icon. It has been in production non-stop for just about 50 years. A bad redesign of the Mustang would give Ford its own version of the "New Coca-Cola" debacle. Fortunately with the new Mustang, it appears Ford has not only saved itself from a big mistake but has really outdone many of its past accomplishments. Even though the basic exterior shape of the new Mustang mimics the Evos show car (something Ford had admitted well over a year ago), the new Mustang is easily recognizable as a Mustang not just from up close but from afar. One fear most Mustang fans had was that the Mustang would look too much like the Evos show car. The Evos was very attractive however it looked more like a modern Aston Martin rather than a Mustang. Ford somehow took the more slippery shape of the Evos and managed to integrate traditional Mustang styling cues. The outcome is sheer brilliance, The hood is long just like previous Mustang models however the hood curves downward as it approaches the front headlights and grille. The hood has a muscular appearance with two long and narrow creases on the top part of the hood. 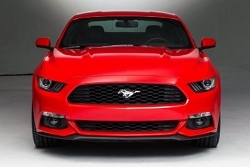 The front grille is very large and looks the 100% the traditional Mustang role – it is blunt. The lower part of the front-end is very modern, much more so than the 2014 Mustang. The headlights now have more of an import look, they look like cat eyes. The roofline is now very similar to that of a modern Porsche 911 versus the current 2005-2014 Mustang roofline. 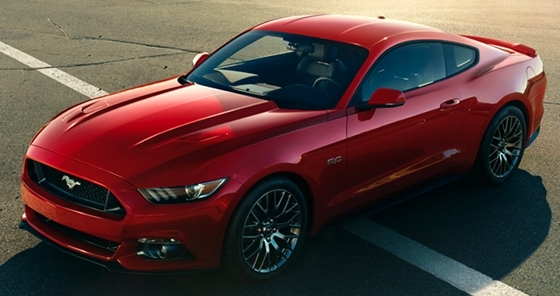 The sides of the new Mustang look muscular due to the horizontal body creases. The body panels on the quarter panels now flare to a much greater extent around the wheel wells giving the car a more exotic performance car look. The area where the fastback style rear window meets the decklid is now very streamlined. 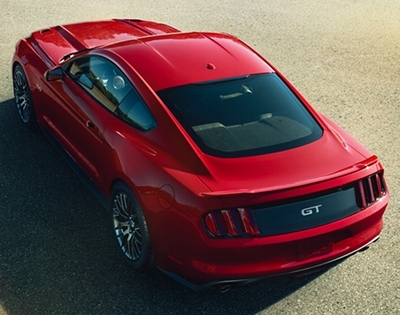 The GT model which is the only 2015 Mustang that Ford has released pictures of thus far, has a nice low profile rear spoiler. However it’s the rear design that is going to be what catches most onlookers attention. If you thought Ford couldn’t improve on the almost perfect looking 2010-2014 Mustang rear taillight design, then think again. 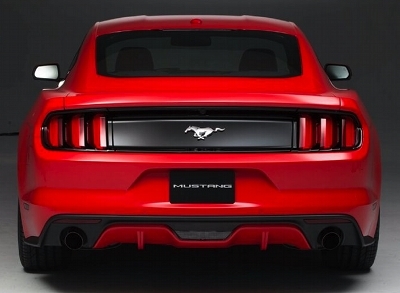 The new Mustang’s taillight design is an absolute work of art. Not only is it more modern than its precursor but it makes it look like chopped liver. The three vertical rectangular red taillight tubes on each side of the rear give the rear a 3D look and the rest of the rear just compliment the overall design. It’s great to see that Ford went that extra mile with the rear design, most automakers spend most of their time designing the rest of the car so when it comes time for the rear they just slap something together too quickly. Ford spent lots of time on the rear design and it shows. Subjectively it’s the best looking rear design on any previous Mustang. One thing that you will notice is that all four wheel wells on the GT model seem to have very little space between them and the tires – just enough space to push one finger between the gap. It makes the Mustang look more like a serious exotic performance car and an overall lower to the ground look – a great optical illusion. However it may make the possibility of adding aftermarket wheels and tires a more difficult endeavor. Overall there are no flaws with this exterior design everything seems perfect, the stubby feel of the current Mustang is gone with the 2015. Ford had to make the car appealing to Mustang enthusiasts while making the body more aerodynamic to meet the ever increasing CAFE standards – not an easy task, but one Ford pulled off brilliantly. And for those who demand open air motoring the 2015 Mustang will also be offered in a very attractive convertible model. The only disappointment here is there doesn’t appear to be a hardtop convertible option for 2015. Ford back in 2009 was strongly considering a retractable hardtop convertible option for the Mustang like many automakers currently offer, but it passed. Ford should reconsider this rash decision, since a retractable hardtop would really give the Mustang convertible a very upscale look – something that might lure BMW buyers into Mustang ownership. The new Mustang has the same overall length (188 inches) and wheelbase (107 inches) as the current Mustang so there should be no loss of interior or cargo space. The Mustang has only gained a few extra inches in width (most of which is due to the flared out fenders) giving the Mustang a more muscular stance. As originally reported the new Mustang is lighter (due to the use of Aluminum for some of the body panels and savings in other areas) than the current Mustang. However Ford is currently mum on how much the weight loss is, however it’s safe to say it’s not the 300 lb diet original reported a few months back. The interior also leaps forward as much as the exterior. 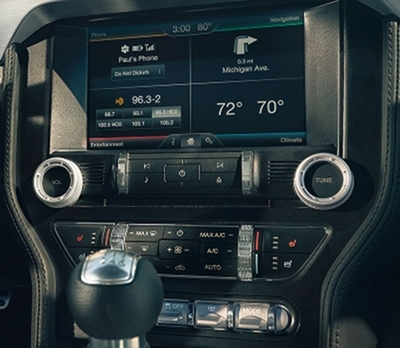 The current Mustang has a well laid out functional interior. 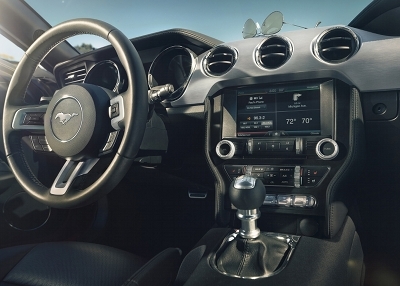 The 2015 Mustang interior has a retro flair but it’s also ultra modern and classier than the current interior. The dash, interior pieces, and panels are European in look, quality, and feel. Don’t understand what I mean, you can grab a BMW buyer and drop that buyer into this cockpit and they won’t want to leave. The front part of the center console seems to rise right into the upper dash board and it is home to some of the best looking buttons and gauges along with a high-tech big screen radio/navigation/and onboard control center. The flowing dash with aluminum and chrome trim pieces is so nicely done. And the beautiful small leather wrapped steering wheel alone will snag some buyers away from the competition. Ride quality should be greatly improved along with overall handling since Ford will finally offer a lightweight independent rear suspension (IRS) something the Mustang’s competitors all have. It’s long overdue. The Mustang won’t share this new IRS with any other Ford offerings and its apparently leagues better than the IRS offered on the special edition SVT Cobra Mustang over a decade ago. With the CAFE ratings ever increasing it’s very good news that the 2015 Mustang GT will still have standard, the potent DOHC 5.0 liter V8. Ford promises output will be slightly higher than the current 420 horsepower and 390 lb-ft of torque ratings. The standard Mustang engine, the DOHC 3.7 liter V6, will according to Ford drop to around 300 horsepower (270 lb-ft of torque). However fear not the horsepower drop of 5 horsepower and 10 lb-ft of torque versus the 2014 Mustang with the same engine is probably merely a change on paper only. Ford is releasing a new optional direct-injected twin-turbo EcoBoost 2.3 liter 4-cylinder that some sources say may produce up to 330 horsepower and around 300 lb-ft of torque. Ford probably wants enough of a horsepower and torque gap between this new turbo motor over the standard V6 since it is an optional motor and after-all they want buyers to opt for it. No word yet if Ford will somehow differentiate the turbo powered Mustangs by calling them something like the Mustang SVO (the SVO was the pricey 2.3 liter turbo powered Mustang from the mid-1980s). And the really good news is that all engines will be available with either a 6-speed automatic or 6-speed manual transmission. In the final analysis all that really matters is will the purists be happy with the new Mustang and will new buyers be lured into Ford dealerships to buy one? After carefully examining Ford’s new Mustang and the changes it brings with it, I firmly believe the answer to both questions will be a big "YES". So for the buyer who wants one of the first batch to arrive at his or her local Ford dealer, expect to pay high dealer markups for the first few months. Ford dealers will also now have a tough time moving the 2014 Mustang inventory, many Mustang buyers will wait for the new 2015 arrive. The way it looks right now, Ford will have another mega success on their hands with the 2015 Mustang, surely the folks at Chevrolet and Dodge must be now breaking out in cold sweats – Ford has upped the ante in the pony car wars again.